The staff preserves your dignity and lowers your level of concern. Very courteous staff all the way around. I felt very welcomed even by those not dealing with me. Each and every time I go to Larchmont Imaging I get the best service. The staff makes me feel very comfortable. Whether it is a mammogram, bone density, x-rays, ultrasound, MRIs, I've always been treated with the utmost respect. They deserve the best for their customer relations. I definitely recommend this place to anyone. It's a nice feeling to know that when I go there I don't feel stressed out or embarrassed. You are the tops. Always a perfect visit – staff is lovely, professional, always a step above any doctor office or lab I have ever been to. Thank you. Your staff is EXCELLENT!!! I was treated with the utmost kindness, sensitivity, and competency. Staff members who exemplified high-level competency and care for patient included: Dan, Darlene, Heidi and Laura – all related to Breast MRI. Additionally, Dr. Zeiberg is, as always, FANTASTIC!!! Outstanding technicians!! You helped make a bad situation bearable. Thank you! First time for me as a walk in – very courteous, caring, and kind. The technologist went above and beyond by explaining my test. This office is extremely efficient and the receptionists are always pleasant and welcoming. Best service ever. Chrissie was extremely pleasant and she explained the procedure. I was very satisfied. Love the new look! As always, great service from all the staff. The technician was superb – I felt very little discomfort! The technicians and staff are outstanding – they are all so helpful and pleasant. Mary and Donna, in particular, were very friendly and helpful. On 3/21/13 I had an MRI done at the Medford Center. Everyone greeted me with a smile and couldn’t have been nicer. Megan and Judy took excellent care of me. They knew I was nervous and they took that extra time to assure me I would be fine. All my worrying was for nothing thanks to these lovely young women. Thank you all for your caring and kindness. It was sincerely appreciated. The staff members at Larchmont Imaging in Mount Laurel have always been professional and friendly, no matter what diagnostic test I am there to receive. They make your visit as nice as they possibly can. I had a wonderful person named Mary who soothed my trepidation and engaged me in friendly conversation as I went through the test. She informed me every step of the way as to what she was doing and why. Bless her for representing your facility. 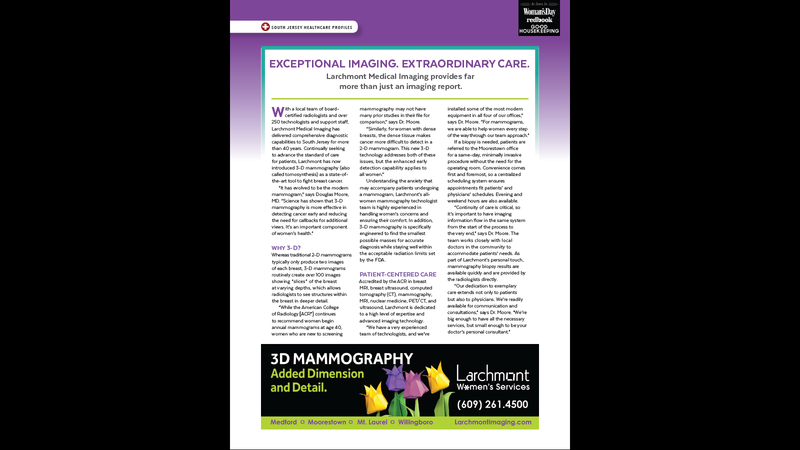 My experience with Larchmont Imaging has always been exceptional. The technician (Mary C.) was very informative regarding the mammography. She took the time to explain the procedure and made sure all the views were detailed for a complete mammogram to ensure nothing was missed. I felt in very good hands; the mammogram starts with the technician and their skills to perform a proper, complete and accurate test, and that was done! Mary and the staff were ALL great, very nice.